(AFP) HAVANA — Venezuelan President Hugo Chavez has flown back to Venezuela after receiving chemotherapy treatment in Cuba for his cancer, Juventud Rebelde newspaper reported Sunday. Cuban President Raul Castro accompanied his Venezuelan counterpart to the airport late Saturday to see him off, the report said. 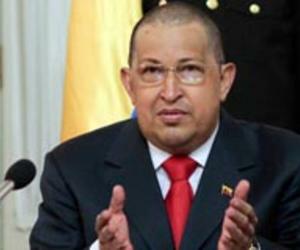 Chavez, 57, underwent an operation in Cuba on June 20 to remove a cancerous tumor in his pelvic area. After a brief return to Caracas, he traveled back to Havana on July 16 for a week to undergo his first chemotherapy treatment. Chavez returned to Cuba again for more treatment on August 6. On Thursday, the Venezuelan leader said his second round of chemotherapy was going well and he will "win the battle" against cancer. "God willing, everything will end well," Chavez said in a telephone interview with Venezuelan state television network VTV. "This is a battle we are winning, and that we will win." 2011 AFP.